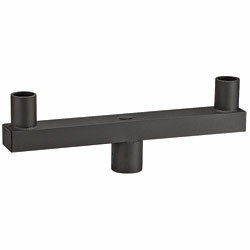 Extruded aluminum mounting tenon bracket slipfits directly over tenons on Vista’s stanchion mounts, post mounts, wall-mount brackets, as well as standard 2" pipe (2-3/8" O.D). The post mount is secured with two ¼" #20 Allen set screws and has dual tenons for slipfitting Vista’s mounting caps. The sturdy construction assures a balanced and stable support for large Vista luminaires.